I run regular workshops that follow a chakra based theme, working on one of the 7 chakras to connect us to ourselves and to the emotion and feelings that we experience through different body parts. Please get in touch for my latest workshop information. EVENTS COMING YOUR WAY SOON INCLUDING A RETREAT for 2020( Please see below). SPACE WORKSHOP , 9th June 2018 @ 10.00-12.30 .Fh Space, Havelock walk Forest Hill ,SE23. During this 2 hour vinyasa flow workshop we will embrace a dynamic but indful practice concentrating on space in the body and mind. Mainly relating to Anahata the heart chakra. These fun but informative workshops draw aspects of kundalini, vinyasa and yin Yoga. Always a focus and a theme with intellegent sequencing. £30 Please contact me for more info on how to pay. Spaces are limited. The Wellbeing Centre , Stone Cross, Pevensey, Sussex. Blocks available for £45 from April 1st. 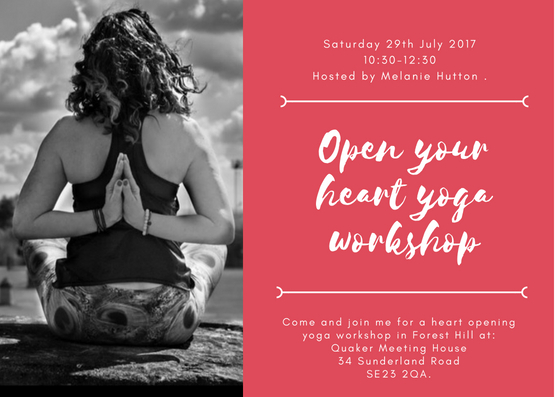 9th June - Space Workshop @ Fh Space , Forest Hill 10-12.30 £30 contact me for bookings or PayPal Mel.therapist@gmail.com.